BIATHLON: It might be one of the toughest Olympic sports on the program but nothing is slowing down young gun Darcie Morton as she continues her rise through the biathlon ranks. The 17-year-old from East Gippsland has had an exceptionally busy year competing at the World Junior Championships before upstaging many of her more-fancied rivals at the Lillehammer 2016 Winter Youth Olympic Games. The daughter of Torino 2006 Olympian Cameron and sister of top Australian men’s athlete Damon, Darcie has recently wrapped up the Australian winter season and is pleased with the progress she is making. “Overall, I was happy with the results and also my training,” Morton said after winning both the U/19 individual and sprint event at the 2016 Australian Championships. The results come off the back of some great performances in Lillehammer where she finished 16th in the sprint and 26th in the pursuit event. With her best year date almost behind her, Morton is now looking to the next chapter of her burgeoning career as she prepares to head back overseas in pursuit of another successful European season. “I am about to head back to Livigno, Italy, where I will train with Luca Bormolini and attend high school to improve my Italian while also studying German, Chemistry and Biology VCE via Distance Education. Morton is aiming to race in the IBU Cup in December in a bid to qualify for the 2017 World Championships in Hochfilzen, Austria. She will then drop back to the juniors and aim for some strong results ahead of the Junior World Championships. And while there is plenty on the calendar, Morton is not pushing herself too hard too early in pursuit of her Olympic dreams. “I am just content in progressing at the best rate I can and I think it is too much pressure to be dreaming of PyeongChang. “I am quite aware that Biathlon is a long term development sport and I will just train as optimally as I can and keep an opened mind where the results can surprise me – like in Lillehammer! She may stand only 150cm tall, but diminutive Australian biathlete Darcie Morton is punching well above her weight and ready for the experience of a lifetime at the Lillehammer 2016 Winter Youth Olympic Games. Asked whether being petite is a disadvantage in such a demanding sport, the 16-year-old said: “I don’t think it makes a difference. You’ve got to be strong in your own way, and fit; that’s the main thing. Lillehammer, Norway – Thursday February 11, 2016: Team Australia at the Youth Olympic Games in Lillehammer, Norway. Darcie is front row on the left with BK, while fellow biathlete Jethro Mahon is also front, second from the right. Hailing from the small town of Marlo in East Gippsland, Victoria, Morton trains at Mount Hotham, which is some three hours and 230km by car from home and has Australia’s only biathlon range. She has been doing biathlon for less than two years, and it’s very much a family affair. “My father (Cameron Morton) competed in biathlon for Australia at the Torino 2006 Winter Olympic Games, and my brother Damon also does biathlon,” Morton said. After going through her paces at the Birkebeineren Cross Country Stadium in preparation for the start of competition on Sunday (14 February), she was upbeat. “We didn’t shoot today, but the skiing was really good. The track here is great and so fast. Plus it’s just a really nice stadium,” Morton said. After a good season, the Australian is optimistic about her prospects at Lillehammer 2016, where she will compete in the 6km sprint and the 7.5km pursuit. “It would be great to get a top-10 finish, or even a top 15 or 20. That would be good for me. It will be really amazing to be racing here in Norway. Just seeing how I compare to other girls my age,” Morton said, speaking at Australia’s team welcome ceremony in Lillehammer. Her Olympian father is always ready with advice, too: “He gives little bits and pieces of advice everywhere. Like, he told me to take hold of this experience and to make the most of it. He told me to do my best, basically,” Morton said. So far, the 2015/16 season has been a good one. “I’ve been in Italy for the European season. I’ve been going to school in Italy, learning German and Italian there, and I’ve been going to Livigno and training with the Australian biathlon team and the Livigno team and travelling to different races around Italy, Austria and Switzerland. “I’ve done a couple of international competitions, like the world juniors in Romania earlier in the season,” Morton said. Despite her quiet self-assurance in matters biathlon, Morton’s recall about her father’s Olympic experience is hazy. “I don’t remember it at all. I was only really, really little,” she said. One thing is for sure, Morton will certainly remember her YOG experience in Norway. Retrans from Australian Olympic Committee: BIATHLON: Darcie Morton and Jethro Mahon have continued their strong build up for the Lillehammer 2016 Winter Youth Games with positive results in Europe over the weekend. Competing at the Junior IBU Cup in Switzerland, Morton claimed a 15th place finish in the women’s 12.5km individual event. The event featured a host of Lillehammer 2016 athletes with the young gun from East Gippsland, Victoria, finishing fourth amongst YOG eligible athletes. “I found the race quite challenging,” said the 16-year-old. “The course featured three major hills with some being 400m long and they had some quick and fast down hills in between. 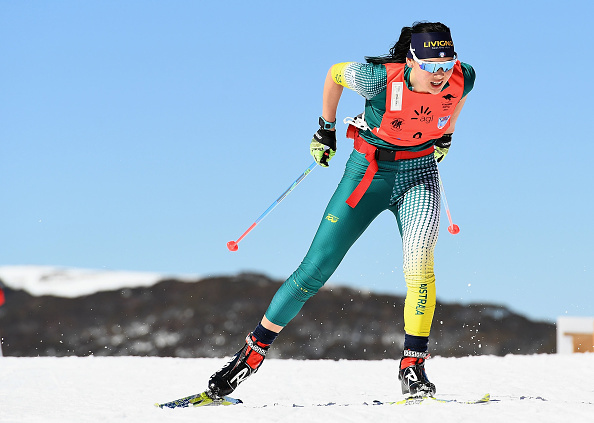 The result was a significant one for Australian Biathlon with Morton’s result seeing her finish in the top half of the field and thus qualify her for next year’s senior IBU Cup events. This could see Darcie join her brother Damon at the senior level and allow them to compete in the mixed relay events as a team. Morton went on to back up her individual performance with a 19th place finish in the sprint event as she finished just over three minutes off the pace. “Overall I am really happy with my results over the weekend and my progress. “Over the last 3 weeks I have completed a really good block of training in an Australian Biathlon National Training camp at altitude in Livigno, Italy. Mahon took to the Brusson course for the Italian Cup as he put in a couple of solid performances as he prepares for the biggest competition of his career to date. In the sprint event Mahon finished in the middle of the pack but shot clear in both rounds as he continues to show his progression in the sport. He shot three clear rounds in the individual event before missing two on the final shoot as he claimed 40th overall, while finishing 15th amongst YOG eligible athletes. Mahon and Morton will next compete at the Italian Cup event in Tesero. It is now exactly a month until the Opening Ceremony at Lillehammer 2016. Australian Biathlon Trimester 2 – a great start! Australian Biathlon Camp 2015/16 Camp training – the snow arrived after this pic! It has been an excellent start for Trimester 2 of the 2015/16 Season for Australian Biathlon! The largest Australian Biathlon Camp in many years has just concluded. Held at Livigno, ITA, 11 athletes including a New Zealand guest have participated in a comprehensive training program, with classic skiing and strength training seshes, in addition to skate skiing and shooting training. The Camp has been run by Coach Luca Bormolini, who has been appointed the Coach for Australia for Youth/Junior World Championships in Romania later this month, in addition to being appointed as Coach to the Australian Team at Winter Youth Olympic Games (WYOG) at Lillehammer in February. While the snow has arrived late in most places in Europe, Livigno has a 10 km manmade XC track, which has meant continuous skiing training throughout the camp. The camp also included a visit to the Martell training arena, where athletes were tested on the tough slopes. This was great practice for the Coppa d’Italia at Brusson ITA, last weekend, which several Australians participated in. Australia’s Male Athlete for WYOG 2016, Jethro Mahon (Melbourne, VIC), put in two great shooting efforts, missing only two targets in the Individual, and none in the Sprint. Last weekend also saw Daniel Walker (Sydney, NSW) participate in IBU Cup 4, obtaining the required qualification points to attend IBU Cup in Trimester 3 (which starts 1 February). At the Junior IBU Cup 3, at Lenzerheide SUI, Darcie Morton (Marlo, VIC) continued her run of successful races, shooting 0-1 in the Women Sprint and 0-0-1-0 in the Women Individual. Older brother Damon (Marlo, VIC) had a very good race in the Men Individual event, finishing 7th and shooting 1-2-0-0. Events continue this coming weekend at IBU Cup and Coppa d’Italia, with nine Australian athletes expected to line up for Y/JWCH, which start on 25 January. The Australian Biathlon Team Camp 2015/16 is at the half way mark. Eleven athletes including a guest New Zealander are taking part in the Camp in Livigno, ITA. This is the largest Australian Team Camp for many years, with participants ranging from new to overseas competition, to more experienced athletes. The group includes the Winter Youth Olympic Games 2016 participants, Jethro Mahon (16, Melbourne, VIC) and Darcie Morton (16, Marlo VIC), with Coach in Charge Luca Bormolini, supported by assistant coaches Christian, Fausto, and Cameron. The Camp is being conducted alongside the Livigno Ski Club and began on 21 December. Luca and his training team have conducted sessions in classic skiing, skiing, shooting and general fitness. While most of Europe is having a poor snow season, the Team has been fortunate to train in Livigno, where there are several kilometres of man made snow loops to practise on. Christmas dinner was held in a mountain hut with special Italian Christmas food. Two birthday cakes were baked on Christmas Eve – one for Harry Jacobs (18, Melbourne, VIC) and one for Darcie Morton (16, Marlo, VIC). The Camp continues until the end of this week, when most of the Camp attenders will take part in various Trimester 2 races, with the rest continuing their training development programs.